Send us your winter golf photos! Have you been out golfing this winter and taken some fun photographs of you and your buddies or maybe some interesting disc golf landscapes? Then send them to me and I'll post them to the blog. I'll even post pix from people who've been lucky enough to play somewhere warmer and less snowy (you jerks!). I'll start it off with a photo I took this morning in my backyard in Pepperell, MA after another 8 inches of snow fell last night. As the Northeast gets hit with another "Storm of the Century! Run! Run! Run!" snowstorm this week, three TDs are getting ready to greet brave golfers at their tournaments this weekend. There are two Ice Bowls and one NEFA Dubs event. If you haven't already, sign up now and help the Ice Bowl TDs raise money and goods for some very deserving charities. Got some fun winter golf photos or stories to share? Send them to me and I'll post them. Single digits? That's perfect weather for winter disc golf! Some crazy disc golfers hit the courses this weekend despite single-digit degrees and 2-plus feet of snow. Here are a few shots from a few Team Challenges this past weekend. Just received this newspaper article published yesterday in the Athol Daily News. You have to be a subscriber to read it, so here it is below. Nice job, Flatrockers! On Saturday January 8 the FlatRock Disc Golf Club hosted its 10th Annual Ice Bowl where players compete in 2 rounds of 18 holes of disc golf -- no matter what the weather. Entry fee for players is 5 pounds of food or cash equivalent going to a local food pantry. Between January 1 and February 27 each year disc golf courses around the country hold Ice Bowls. The only steadfast rule is that the event cannot be cancelled for weather related reasons. In the past FlatRock has enjoyed Ice Bowl conditions ranging from -5 degrees in 2005 to 68 degrees in 2007. Players have played in snow as deep as two feet before, but this year the weather really cooperated. Participants enjoyed 22 degrees and played on a mere 2 inches of snow. Collectively, nationwide, the goal this year is to raise $3000,000 for food charities. This is a realistic goal given last years numbers of 222 events with over 11,000 participants raising $279,746 dollars and more than 34 tons of food. Sixty-two players competed at FlatRock this past Saturday and between them they raised 215 pounds of food and $286 dollars. This year the donations are earmarked for the North Quabbin Catholic Community food programs. 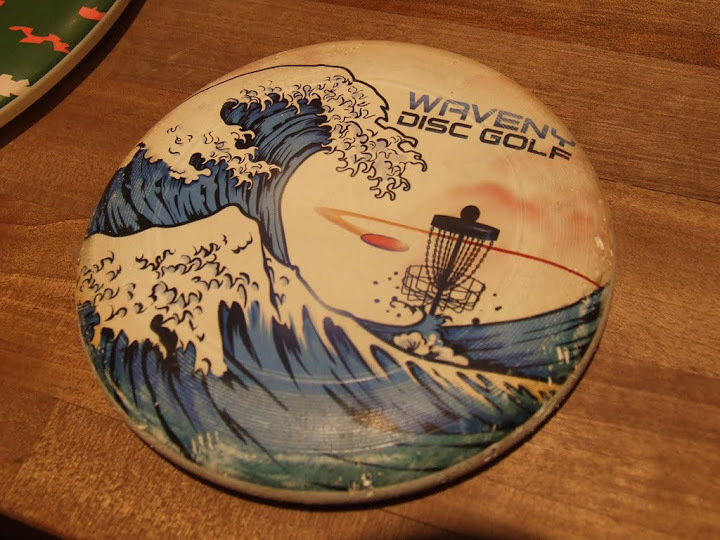 Waveny Open disc wins Best Design of the Year contest! Congratulations to the Waveny crew for winning the first annual Best Design of the Year contest! Five-star votes flooded the poll giving the Wave a commanding win with an average 4.31 out of 5 stars. Coming in second by a hair was the Sap Bucket design with a 3.47 rating, followed by the Pyebrook EMC design at 3.46. Over one hundred sets of votes were tallied. Thanks for voting and l look forward to some more great designs in 2011!